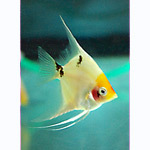 A peaceful fish that can be combined in any community tank with other peaceful, medium to large sized fishes. Do not combine with small fishes for these will likely be eaten. Angels can be kept in a pair or in a group. For pairing, raise a group of individuals from youth, and select a pair that forms. The aquarium should be set up with large plants, driftwood and roots for hiding places, but leave an open area for swimming. The fish is a hardy fish recommended for beginners. The height of the aquarium should be at least 50 cm (20"). The fish is omnivorous. You should give them a great variety of live, frozen and dry food. Breeding is rather easy. In soft acidic water up to 1000 eggs are laid on a leave of a plant ore on any other flat substrate. Both parents take care of the fry. After about 60 hours the eggs hatch and another 5 days later the young fishes are swimming free. The best thing to feed the youngsters is newly hatched baby brine shrimp. Selective breeding has produced many color forms and varieties with dramatic finnage.